Foot cramps can totally hobble you, and strike at almost any time—in the middle of the night, at work, or out on the town. The foot muscles contract suddenly and violently, causing pain that can be quite intense. Most cramps, fortunately, only last two or three minutes at the very most, but others can stretch on for hours or even days. In most cases, the best remedy for a cramp is a little self-care. Massaging and stretching the foot when symptoms strike can help bring swifter relief. Gently pull the toes upward, and stretch the foot in the opposite direction of the cramp. Using your thumbs to massage the contracted muscles can also help them gradually relax, relieving the pain. You may also try a heating pad or foot soak, or even eating a banana (potassium helps). Almost anybody can get a foot cramp under the right circumstances, so if you’ve only had one or two brief issues over the course of an extended period of time, it’s probably nothing to worry too much about. 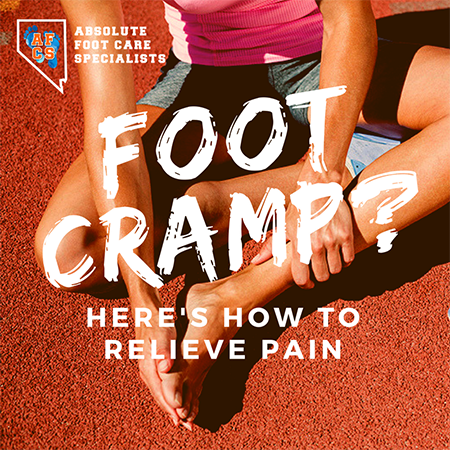 However, foot cramps that are exceedingly painful, last more than a few minutes, or reoccur frequently are indicative of a more significant problem and need to be carefully evaluated by a professional. A large number of factors can contribute to cramping—everything from simple muscle fatigue to low circulation, poor diet, dehydration, flat feet, thyroid problems, pinched nerves, diabetes, and other conditions or diseases. Over the long term, making sure you eat healthy meals, get plenty of essential nutrients (particularly potassium and Vitamin D), and drink lots of water will often help significantly reduce the frequency and severity of your cramps. However, you may need additional treatment as well. Our office can help coach you through the best stretches for relieving your cramps, as well as provide muscle relaxers if necessary. Furthermore, we can provide additional assistance, such as orthotics for flat feet, that address the specific underlying causes of your cramping, rather than just the symptoms. Persistent painful cramps should be evaluated, as there is often a solution that can bring long-term relief. To schedule an appointment with the foot care team at Absolute Foot Care Specialists, give us a call at (702) 839-2010 or fill out our contact form online.